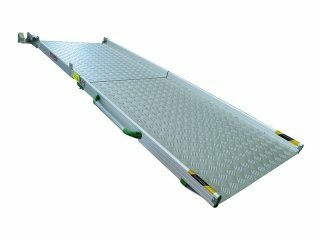 Speedyramp transport ramps are ideal for loading and unloading any type of goods, but also for transporting motorbikes, quadbikes, work tools and industrial cleaning equipment. 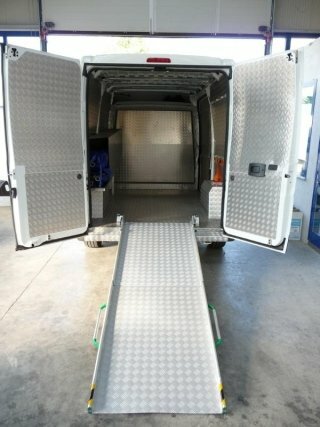 As a result of the aluminium construction, our ramps are durable and do not require maintenance. Thanks to the convenient thumb nuts, they can easily be assembled and disassembled from any vehicle. Speedyramps do not require vehicle approval and conform to all Italian and European regulations (Directive 89/391 / EEC; DIR 90/269 / EEC; DIR 2007/30 / EC). Plant specialists - electricians - plumbers - cleaning companies and services - catering facilities - industrial laundries - the transport of: paper - wine - mineral water - plants - flowers - ladders - groceries - furniture - clothing - paints - carpets - computer appliances spare parts - planners - extinguishers - lubricants - spare parts - sanders - scrubbers - paper sweepers - motorcycles - bikes - scooters - air generators - gardening machines - work carts - tiles - traffic lights - fireplaces - horizontal pneumatic marking machines - transport of the elderly and people with disabilities.